POWERING BRANDS: Campaign Watch: Century Ply. What's anger got to do with it? Campaign Watch: Century Ply. What's anger got to do with it? I'll start by saying that I don’t get the Century Ply campaign concept. I find the image of the gorilla and the notion of anger unconnected to a contemporary plywood/veneer product but it sure has created a buzz. As they say, if you can get people talking, you are halfway through. I get that they wanted to communicate the 'durability and strength' of the product but they’ve taken the 'sab sahe mast rahe' positioning too far with this idea. Century Ply started out with a successful teaser campaign culminating in the perfectly timed TVC launch on 28th August, World Anger Day. Out-of-home was used in a big way to build hype. The brand has gone the distance online with a website, social media presence across Facebook, Youtube, Twitter and Pinterest and media presence across nearly all publishers. 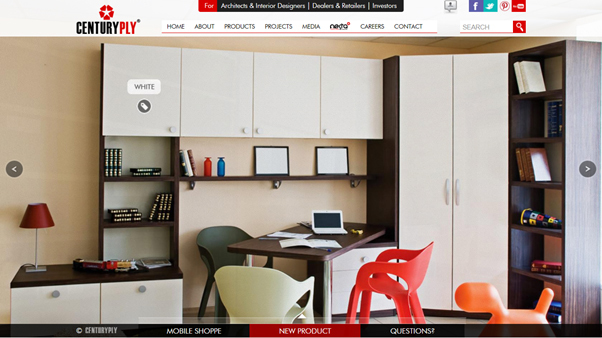 Facebook posts on Century Ply's Brand Page hinge on home decor options and ideas. Pinterest is actually a great medium to catch end-user fancy with high quality product imagery and design ideas. Maybe they could eventually take it a step further with some user interaction ideas rather than only using it as a show-board. The brand website is really well laid out and grabs your attention but seems like is yet to be updated with new campaign related content. A Century Ply mobile site featuring the latest collection is under development. The brand is really going all out on digital platforms and we love that. What do you think of the campaign?